NEW! Mobile News Scaled for your smart phone. Get Ready for Bike to Work Week 2018!!! More info coming soon... Stop back soon for more info and a new look to the page! 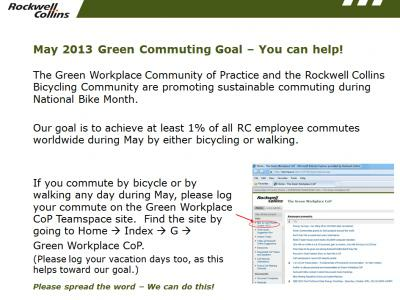 In the mean time, check out these community based (Not Rockwell specific) Facebook pages for more info about bike to work week activities. Need Help Biking 2 Work? 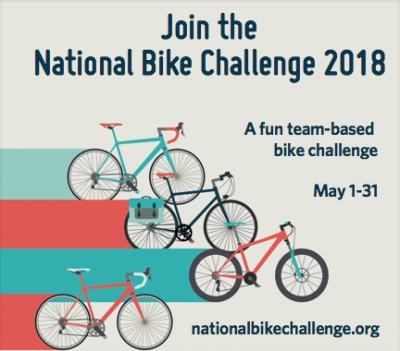 Rockwell Collins is participating in the National Bike Challenge. We are just in the warm up now...but sign up...you can win prizes...but even better...compete with Rockwell Collins as a whole and individually with your state. Sign up for Rockwell Collins workplace...then go to teams. If your Rockwell Collins-STATE has not started yet....go ahead and register it. Utah and Iowa are already teams...under the Rockwell Collins Banner! 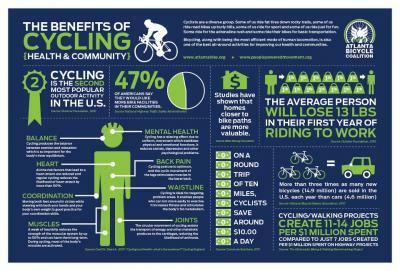 May is Bike Month! Get out and Ride! Rockwell Collins in Salt Lake City is also a Bicycle Friendly Buiness Bronze Level, earning that recognition in 2011, a year before the Rockwell Collins Cedar Rapids facility earned the Bronze Award in 2012. This photo is used by Salt Lake County, via Bike League Magazine. The Collins Bicycling Community is solely responsible for the content of this web site. Such content does not necessarily reflect the views of Rockwell Collins, Inc. Copyright © 2019 Collins Bicycling Community • All rights reserved.